Preparation: Use the HOT POTATO game to reinforce memorization of the Ten Commandments Look n' Learn hand signals (read reviews, below). How to Play: You will need a potato or small ball. Children sit or stand in a circle. Players pass the potato around the circle until teacher calls out a commandment number (1-10), at which point players stop passing the potato. 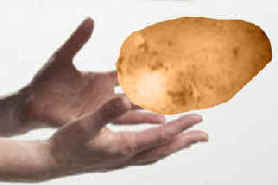 For example, if teacher calls out "3", the player holding the potato must then say, "Don't misuse God's name." If the player cannot remember the commandment, then say, "Think of the hand signal." If player still can't say the commandment, you have the option to eliminate the player or allow the child to remain playing and continue playing as before. Play as long as time allows. Find more Ten Commandments Bible games.